How to Develop a Chat App Like SnapChat and How Much It Costs in 2019? Imagine you’re a college student who develops a photo messaging app with your frat buddies, everybody says that it is a terrible idea, and a couple of years later digital giants like Facebook or Google offer you from $3 to $4 billion to buy it, but you reject the offer. Another three years and your company are worth $20 billion. It might seem like a dream, but it's actually a true story. The narrative above is a success story of Snapchat, a mobile messenger with text, photo, video content that disappears a few seconds after it is received. This success inspires a lot of entrepreneurs, and we receive a lot of requests to estimate the cost to build an app like SnapChat. Currently, there is a multitude of social media platforms to choose from and, according to the latest statistics, Snapchat is the leading social media network in such countries as the United States and France, following WhatsApp closely in Canada, UK, and Germany. See also: How to Develop a Messaging app Like WhatsApp? SnapChat's daily video views have increased by 400% year-on-year. Almost 150 million people use the free app daily. More than 60% of 13- to 34-year-old U.S. smartphone users are on the service. From the beginning, SnapChat owners didn’t carry about making money. But later the app provided several ways of generating the revenue. In 2015 Snapchat revenue amounted to $100 million, with goals to the tune of as much as $300 million this year, according to a report from Re/code. We’ll return to the monetization issue later. Now let’s be consistent and start from an overview of SnapChat features. To examine them is crucial while considering how to make an app like Snapchat. When you heard about SnapChat a few years ago, it was a simple messaging app with a primary feature of vanishing messages in one to 10 seconds. But over time, it has added a vast amount of new incredible features, which provide more immersive interaction with the app. In other words, Snapchat gradually evolved into a mix of private messaging and public content, including brand networks, video-sharing, and live events. Moreover, Snapchat expanded its capabilities and became a multi-entertainment app, transforming from a messaging platform into a media giant with 10 billion video views per day, Bloomberg has reported. Memories is one of the features that provide a new way to save Snaps and Stories on Snapchat. Users can create new Stories from Snaps they’ve taken, or even combine different Stories into a more extended narrative. Also, Snapchat has launched some new features, including new photo and video filters, a capability to add emoji stickers to videos, changes in chat. Let’s begin to examine the components of the app from basic features to an innovative one. SnapChat has added additional value to such a simple thing like chatting, providing it with a set of amazing features. Users can create multimedia messages called "snaps." These snaps can comprise photo or a short video; they can be edited with filters and effects, text captions, and drawings. In Chat 2.0 recent update you can send audio notes, make video and audio calls. Snaps can be directed privately to selected contacts, or a semi-public "Story." The privately sent messages can be automatically self-destructed after a few seconds. Also, an app allows location sharing. 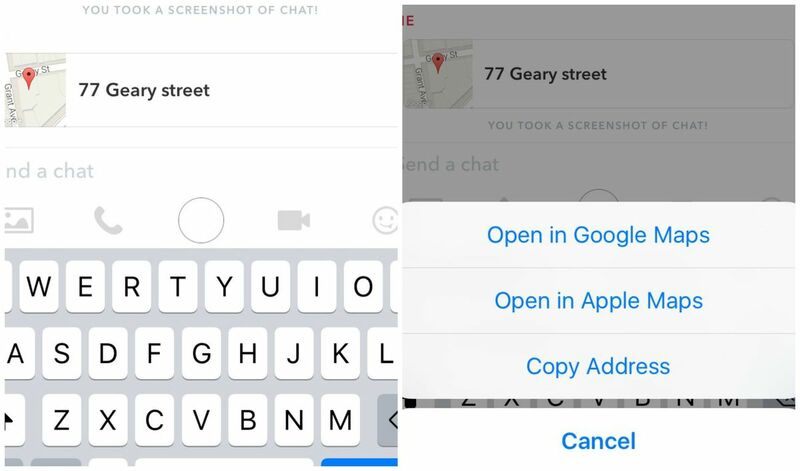 When the user starts typing an address into chat, it displays in a card that links to the Google or Apple Maps app. Self-destructing messages are a custom feature of Snapchat and one of the things that made it so popular among teenagers. Before you create custom features, you need to develop a messenger app. Answering the question “How to make a messenger app?” we recommend to use the ready-made solutions as a basis for your future product to save your money and time. For instance, it could be Facebook Messenger SDK or Telegram SDK. The SDK for Messenger allows your app share images, animated gifs, videos, and audio clips. With such an approach, the messaging app development usually takes 1,5 months for two platforms - iOS and Android. It costs about $10K for the iOS platform and $9K for Android. But the messenger app development cost depends on the functionality you want to implement. The introduction of advanced features can take about six months. The good news is that the self-destructed messages aren’t a big deal. It is a custom setting, which is carried out by an additional query to the server to delete the message from a client. The user sends a friend a message, and it is uploaded to the Snapchat servers. The recipient gets push notification of the arrival of a new snap. Then the snap is downloaded in a temporary location on the phone. When the recipient has viewed the message, the time starts to run out. The app deletes the temporary copy of the snap in the phone and alerts the Snapchat server. The snap is destroyed from Snapchat’s servers. If the recipient has not viewed the snap within 30 days, it is deleted automatically. Stickers became an inevitable part of modern communication. 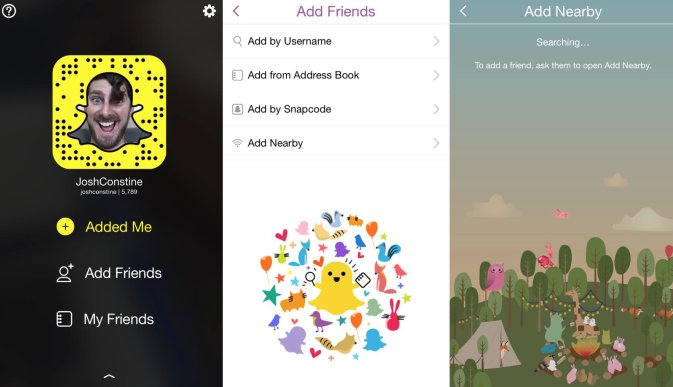 Snapchat contains 200 stickers built into its app. You can use a custom solution (design your stickers) or use a ready-made solution that is much cheaper. Developers can use Apple MapKit and Google Location SDK to implement this feature. It gives them all tools that are necessary to create custom solutions for different operating systems. To enable location sharing in your app costs roughly from $2K to $4K for both platforms. Black dots that surround Snapchat Ghostface Chilla logo is a personalized QR code. Another user can scan it by using the Snapchat camera, and he begins instantly follow you. Here are used recognition algorithm and an algorithm for the generation of such codes. To create these algorithms takes roughly one month with a cost from $8K to $10K per one platform. It uses your location to scan what other users in your proximity also have Add Nearby open. The app sends the device's coordinates to the server, the server in its turn compares the geolocations of devices with opened Add Nearby screen. The implementation of this function can take about one week and cost about $3K for one platform. In the updated version of chat, the app users can start talking or video chatting instantly with one tap. If the recipient isn’t online, you can send an audio note. This feature turns Snapchat into a phone alternative and brings it next to Facebook Messenger and Whatsapp. The app uses technology from AddLive — a real-time communications provider - to provide video chat feature. It usually takes two months to develop perform this option. A feature is known as "Geofilters" is a special graphical overlay that is available when the user is within a precise geographical location, such as a city, event, or destination. To let your users mark their location on the images, the developers use the geocoding. Geocoding is a computational process that converts the geographic coordinates to a description of a location, usually the name of a place. Then the name of the area is overlaid on the image in some template. It takes about 3 weeks and costs about $4K per platform to create within the chat app development project. The "Lens" is one of the most exciting features of Snapchat. It allows users to add real-time effects and alter video images by using face detection technology. This feature became possible when Snapchat acquired the startup Looksery, which does a facial modification and enables users to simulate their appearance for a photo or video chat in real-time on mobile platforms. To develop the same technology from scratch takes plenty of resources and money. But if you want your app to have this feature at all costs, you can use the Mirror Reality SDK for iOS and Android developers. The SDK allows applying a real-time video face effects, giving developers the tools to design high-grade face swapping apps for iPhones, iPads, and Android devices. Stories functionality lets users broadcast photo and video content from their lives to friends; each story lasts 24 hours. It refers to public content and provides users with capabilities in the same way as social networks do. Later this feature was expanded to "Live Stories." This enables new functionality when Snapchatters who are at the same event location (such as music festivals or sporting events) can contribute snaps to the same Story. Discover feature delivers content from publishers and advertisers. Users can subscribe to media channels of the partners and see promoted content. Snapchat lets brands create their own filters and lenses. 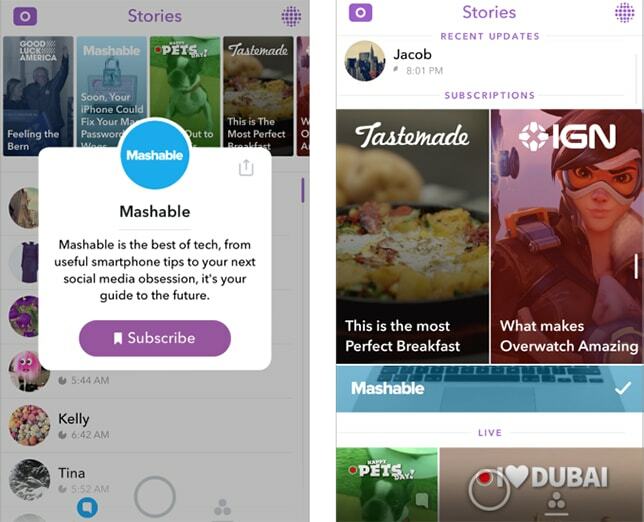 Additionally, Snapchat has opened ads API and announced a vast number of promotional instruments, including snap ads between Stories, expandable “Snap Ads” and ads API itself. All these features let advertisers use programmatic interfaces to run large-scale campaigns instead of making the manually strike deals with Snapchat. So, how much does it cost to build an app like SnapChat? To sum up, all the facts we’ve described above, Snapchat seems to be a huge machine with innumerable features. It will take more than a year to create something like this. And the price of this will be innumerable as well. According to The App Solutions rates, the total cost of such an app with basic functionality can amount from $50K to $70K per one platform. In such a case, it is hard to give accurate project estimation. But you should take notice of the following - app development cost is determined by the three main factors that have an impact on the total budget and project duration. The amount of work to be done and features to be implemented. It's not obligatory to implement all the features presented in SnapChat. You can choose some of the best features, and we estimate how long and how much it will take. The timing of the project. The same amount of work can be carried out in different time frames. It depends on the number of developers involved in the project. Budget. We prefer Time&Material budgeting for smaller projects and Dedicated Team models for longer-term projects. They both have their advantages and it's one of the discussion points with Business Analyst at the very beginning of cooperation, once you get a rough estimate of the total project cost. So, feel free to contact us with any questions on how to develop a chat application. The App Solutions team will help you to estimate and realize any your ambitious project. HOW MUCH DOES IT COST TO DEVELOP AN APP LIKE AIRBNB?